The first record of a Jewish cemetery in Raleigh is contained in a deed from the Raleigh Cemetery Association (owner of Oakwood Cemetery) to the Hebrew Cemetery Association in 1871. The deed conveyed a small section, 125 feet long by 35 feet wide, in the very large Oakwood Cemetery. There are forty two graves in this first Jewish cemetery, located near the Confederate Cemetery inside Oakwood Cemetery. 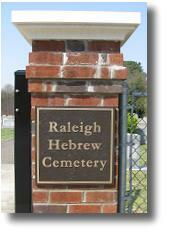 When the community needed more space, two acres of land adjoining the eastern edge of Oakwood Cemetery were purchased, and the Raleigh Hebrew Cemetery Association was established. Opened in 1922, this beautiful and serene cemetery is located northeast of downtown Raleigh. It is well-maintained and lined with attractive landscaping. Charter members of the Association are listed on a plaque at the cemetery gate. These founders and their successors take seriously the mitzvah of burying the dead with all due respect in a peaceful, dignified facility. As the Raleigh and Wake County Jewish community has grown, additional land was cleared and grave sites prepared. In 1982 a section of the Cemetery was opened to permit burial of non-Jewish spouses. In early 2000 the last available section of the cemetery was cleared and is now being used for burials.